Use Canva’s drag-and-drop design tools to create professionally designed rack cards that stop traffic. Whether you’re creating a rack card for a business, organization, club or class, it’s important to present all the details clearly and effectively. Because let’s face it, who wants to read a boring rack card with tacky imagery and garish fonts? Canva helps you design a rack card that truly stands out from the rest. Not only that, a striking design is more likely to get picked up and read. With a huge selection of layouts, images, fonts and design elements at your fingertips, you can create a beautiful design – even if you don’t have any graphic design experience. Create a new Canva account to get started with your own Rack Card designs. Imagery is powerful and it really has the power to cement your brand’s look and feel, so it’s important that any imagery you choose to use is of the highest quality. Canva gives you access to a stock library of over a million professional images, graphics and illustrations. Not only do these images look great, a lot of them are free to use. If a premium image takes your fancy, don’t worry about breaking the bank because a premium image only costs $1 a piece. And if you want to make your rack card truly your own, you can do that too. 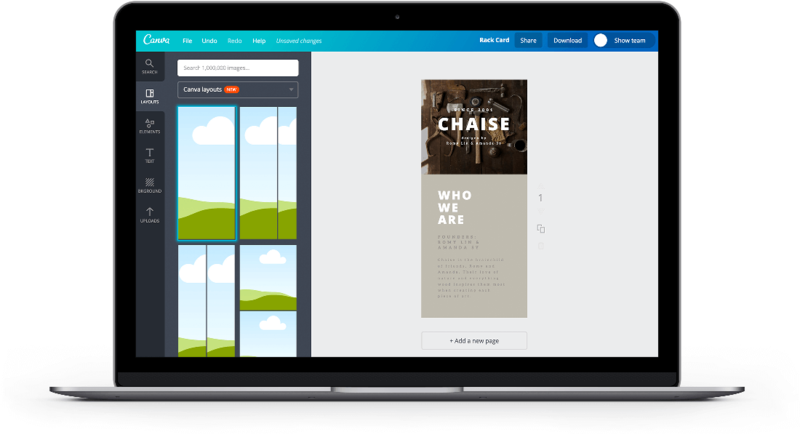 The Canva platform allows all users to upload their own images for free. Don’t have the cash to hire a designer? There’s no need to fret. We believe that money shouldn’t hold you back from creating something great, so with Canva you have the ability to create a professional quality rack card without spending a fortune. All of our layouts have been produced by a team of expert graphic designers, giving you free access to high-end designs created with an artist’s eye. Once you’re happy with your design, it’s time to download and print. While a well-designed rack card is important, we recognise that its quality, vibrancy and clarity is too. So we’ve made sure that when you download your rack card, you can do so in stunning high resolution. This ensures that when you print your design, it looks as eye-catching in a rack as it does on your screen. Simply click the download button and save your rack card as a print-ready PDF. This will ensure your design is printed at the highest possible quality. There are watermarks on my design. How can I remove them? At this point, you will be prompted to pay for any images within your design. Once you do, your image or PDF will download straight to your computer without the watermarks.